Objective: To investigate the inhibitory effects against dengue virus serotype 2 (DENV-2) by five different fractions (extracted by methanol, ethanol, benzene, chloroform and n-hexane) of Rumex dentatus, Commelina benghalensis, Ajuga bracteosa and Ziziphus mauritiana, as well as their constituents (gallic acid, emodin, and isovanillic acid). Methods: All the samples were tested for cytotoxicity on baby hamster kidney cells by MTT assay and for anti-DENV-2 activity by plaque reduction neutralization assay using two DENV-2 doses (45 and 90 plaque- forming units or PFU). Results: All the samples except isovanillic acid exhibited significant prophylactic effects against DENV-2 infectivity (without cytotoxicity) when administered to cells before infection, but were not effective when given 6 h post-infection. The methanol extract of Rumex dentatus demonstrated the highest antiviral efficacy by inhibiting DENV-2 replication, with IC50 of 0.154 μg/mL and 0.234 μg/mL, when added before infection with 45 and 90 PFU of virus, respectively. Gallic acid also exhibited significant antiviral effects by prophylactic treatment prior to virus adsorption on cells, with IC50 of 0.191 μg/mL and 0.522μg/ mL at 45 and 90 PFU of DENV-2 infection, respectively. Conclusions: The highly potent activities of the extracts and constituent compounds of these plants against DENV-2 infectivity highlight their potential as targets for further research to identify novel antiviral agents against dengue. Dengue is a virulent acute systemic viral disease that represents a major health, economic and social problem in tropical and subtropical areas of the world. It is an arthropod-borne human disease that spreads through the bite of the Aedes mosquito which serves as the carrier of the pathogenic viruses. Aedes aegypti is the primary vector, while Aedes albopictus is the secondary mosquito vector. Four genetically distinct but antigenically similar dengue virus (DENV) serotypes (DENV-1, 2, 3, 4) belonging to the Flavivirus family cause the infection. Dengue viruses are prevalent in over 125 tropical and sub-tropical countries, and 390 000 000 infections occur annually,. DENV infection in humans is frequently asymptomatic, but may result in a spectrum of clinical manifestations that vary from undifferentiated fever to severe dengue such as fatal dengue shock syndrome,. Lifelong immunity may develop after infection in a serotype-specific manner, but may progress to more severe disease following secondary infection by a heterologous serotype. During secondary infection by a different viral serotype, the memory B and T cells corresponding to the primary infection are preferentially reactivated, resulting in antibody- dependent enhancement of the infection that initiates mechanisms of severe dengue,. Although the four DENV serotypes produce similar types of infection, DENV-2 and DENV-3 are more frequently linked to severe and fatal dengue hemorrhagic fever or DHF,. In Pakistan, many dengue outbreaks have been documented from 1994 to 2011. The first report of dengue from Pakistan was in 1982, in which 12 out of 174 patients from Punjab were victims of the infection. Although a dengue vaccine is currently available, it is suboptimal, thus emphasizing the need for developing new antiviral drugs. Medicinal plants have been used for the treatment of human diseases for centuries. These remedies remain an important source of novel bioactive chemical compounds, such as antimicrobial agents. We previously documented the antiviral activities of extracts of Houttuynia cordata and its constituent compounds on dengue virus and murine coronavirus infections,. Pakistan has a plethora of natural resources, varied ecological regions, and abundant flora. Out of 6 000 higher plant species found in Pakistan, 600-700 are reported to be used medicinally, and belong to different plant families. One of the medicinally important plants, Rumex dentatus (R. dentatus) L. (known as toothed dock), is used locally as a vegetable in the Kashmir valley. It belongs to the family Polygonaceae, and is found throughout temperate western Himalayas from Kashmir to Kumaon at 8 000-12 000 feet. It produces a large variety of chemically complex and bioactive compounds, and is traditionally utilized for its bactericidal, antitumor, anti-dermatitis, anti-inflammatory, astringent, tonic, diuretic, and laxative properties,,. Also known as Ber and belonging to the family Rhamnaceae, Ziziphus mauritiana (Z. mauritiana) is a spiny fruit tree that grows in tropical and sub-tropical regions of the world. Different parts of this plant are used in traditional medicine for treating diseases such as allergies, depression, ulcers and asthma. The leaves of Z. mauritiana are used for the treatment of liver diseases, asthma and fever, while the fruits are used as wound healing, sedative and anti-cancer agents. Commelina benghalensis (C. benghalensis) Linn. (Commelinaceae), commonly known as Benghal dayflower or Dew flower, is a tropical perennial herb native to Asia and Africa. In Pakistan, it is used as animal fodder, but is also eaten by humans as a vegetable. The plant is also medicinally important, is used for its laxative effects, and to treat leprosy, psychosis and skin inflammation. The hepato-protective activity of its root extract against paracetamol-induced hepatic damage in Wistar rats is also documented. The plant is also well-known for its anti-cancer, anti-tumor and anti-oxidant activities ,,. Ajuga bracteosa (A. bracteosa) Wall. ex. Benth. (family Labiateae) is an important medicinal herb widely distributed in Kashmir and sub- Himalayan tract. Its leaves have diuretic functions, and have been effectively used as a blood purifier and cooling agent. Moreover, this herb is used for treatment of gout, cancer, gastric ulcer, palsy, liver fibrosis, and protozoal diseases,. The objectives of this study are to analyze the DENV antiviral activities of these four medicinally important plants: R. dentatus, C. benghalensis, A. bracteosa, Z. mauritiana, together with three pure compounds: gallic acid, emodin and isovanillic acid. R. dentatus, C. benghalensis, Z. mauritiana and A. bracteosa were collected from Balakot, Pakistan. Plants were identified and authenticated by a taxonomist, Rizwana Aleem Qureshi, Professor of Taxonomy, Department of Plant Sciences, Quaid-i-Azam University, Islamabad, Pakistan. A voucher specimen of each plant was deposited in the herbarium of the Plant Biochemistry and Molecular Biology Laboratory, Quaid-i-Azam University, Islamabad (Z. mauritiana HPBMBL-16-018, C. benghalensis HPBMBL-16- 019, R. dentatus HPBMBL-16-023, A. bracteosa HPBMBL-16- 043). Five different extracts of each plant were prepared using methanol, ethanol, benzene, chloroform and n-hexane solvents. Plants were washed thoroughly with tap water, rinsed with distilled water, dried and ground to powder form. Each plant material (50 g) was extracted with 500 mL of each solvent by maceration. Plant powder was soaked in the respective solvent for 7 d, and then filtered through Whatman filter paper number 1. Filtrates were evaporated using a rotary evaporator, and extracts were dissolved in DMSO at 20 mg/mL, and stored at 4 °C for further use. Extracts are abbreviated as follows: R. dentatus methanol (RM), ethanol (RE), benzene (RB), chloroform (RC), n-hexane (RH); A. bracteosa (AM, AE, AB, AC, AH); C. benghalensis (CM, CE, CB, CC, CH); and Z. mauritiana (ZM, ZE, ZB, ZC, ZH). In view of their significant antiviral activities, the RM, CM, AH and ZM extracts were selected for HPLC analysis. Pure compounds were purchased from Sigma-Aldrich, i.e. gallic acid, emodin, and isovanillic acid. Plant extracts were analyzed by HPLC apparatus (Agilent) using Sorbex RXC8 analytical column (Agilent) with 5 μηι particle size and 25 mL capacity. Mobile phase consisted of eluent A (acetonitrile-methanol-water-acetic acid at 5:10:85:1) and eluent B (acetonitrile-methanol-acetic acid at 40:60:1). The gradient (A:B) utilized was as follows: 0-20 min (0% to 50% B), 20-25 min (50% to 100% B), and then isocratic 100% B (25-40 min) at a flow rate of 1 mL/min. The injection volume of each sample was 20 μL, with the detection wavelength set at 252 nm. Each sample was filtered through a 0.45 μm membrane before injection, and the column was reconditioned for 10 min before the next analysis. All samples were assayed in triplicates. Quantification was carried out by the integration of the peak using the external standard method. All chromatographic operations were performed at ambient temperature. The New Guinea C strain of DENV-2 was propagated in the C6/36 Aedes albopictus mosquito cell line. Tissue culture flasks (25 or 75 cm2) with confluent monolayers of C6/36 cells were inoculated with 0.2 or 1.0 mL of infected cell culture fluid, and incubated at 28 °C until complete cytopathic effect was observed in about 3-5 d. The infected cell culture fluid was then harvested, aliquoted, and stored at -80 °C, or used to inoculate fresh monolayers of C6/36 cells. Baby hamster kidney (BHK-21) cells were cultured in RPMI- 1640 medium containing 10% fetal bovine serum at 37 °C under 5% CO2. The MTT cell proliferation assay was performed to determine the maximum non-toxic doses of the plant extracts and compounds. Various concentrations of each fraction and compound were added (in triplicate) to wells containing cell monolayers and incubated at 37 °C under 5% CO2 for 48 h. After incubation, MTT reagent was added to each well, and further incubated for 4 h or until purple precipitates were visible under an inverted microscope. Then, 100 μL of 100% DMSO was added to each well, and incubated for 15 min at room temperature. The absorbance at 570 nm was measured, and the cell inhibition rate calculated from the formula: [1–(OD of sample with cells)–(OD of sample without cells) divided by (OD of solvent with cells)–(OD of medium without cells)] ×100%. The plant extract fractions and compounds were tested at the same concentrations as those for plaque reduction neutralization tests. The assay included wells containing medium only as well as untreated control cells. Each experiment was repeated, and the means and standard deviations were calculated. The inhibition rate of each extract and compound was plotted against various concentrations of the test agents to ascertain the concentration that causes 50% cytotoxicity (CC50). To test different concentrations of plant extracts and compounds, each was two-fold serially diluted, while two DENV-2 concentrations (45 and 90 plaque-forming units or PFU) were investigated. Hence, test samples were evaluated for anti-DENV-2 activity by plaque reduction neutralization test, using two investigational approaches. In both strategies, BHK-21 fibroblasts were cultured to form cell monolayers in 24-well plates with RPMI- 1640 supplemented with 10% fetal bovine serum at 37 °C under 5% CO2. The test samples were dissolved in 1% PBS, and two-fold serial dilutions were prepared to evaluate various concentrations. DENV-2 New Guinea C neutralizing monoclonal antibody 3H5.1 (Chemicon) served as the positive control. Negative controls included 0.5% DMSO, virus alone, and cells alone. Each experiment was performed in duplicate. In the first experimental strategy, DENV-2 (45 and 90 PFU) was incubated with various concentrations of each sample together with controls for 1 h before adding to the cells. These virus-sample mixtures were incubated with the cells for another hour at 37C under 5% CO2 with rocking at 15-min intervals. Then, cells were overlaid with 1.2% Avicel at 37 °C under 5% CO2 for 5 d.
In the second experimental approach, cells were first infected with 45 and 90 PFU of DENV-2, and after 6 h post-infection, various concentrations of each extract and compound were added to the infected cells. The cells were also overlaid with 1.2% Avicel under the same conditions for 5 d. The cells were then fixed with 20% formaldehyde, stained with 1% crystal violet, and the number of plaques was counted. The percentage plaque reduction of each sample at each dilution was determined as follows: (mean number of plaques in virus control)–(average number of plaques in sample) ×100% divided by (mean number of plaques in virus control). The percentage plaque reduction was plotted against various concentrations of the test agents to determine the concentration that causes 50% plaque reduction (IC50). HPLC analysis was performed on the plant extracts with potent antiviral activity to determine the presence of gallic acid, emodin and isovanillic acid in these extracts. The pure compounds of gallic acid, emodin and isovanillic acid served as standards, and their retention times were 4.83, 24.34 and 17.06 min, respectively [Figure 1]. The peaks detected in the RM extract at 4.73, 24.23 and 17.31 min were comparable to those of the standards, and thus confirmed the presence of gallic acid, emodin and isovanillic acid, respectively. The chromatograms of AH (0.23 mg/dry weight extract), ZM (0.02 mg/dry weight extract) and CM (1.61 mg/ dry weight extract) demonstrated the presence of gallic acid with retention times of 4.80, 4.43 and 4.52 min, respectively [Figure 2]. Emodin and isovanillic acid were detected only in the RM extract. The quantities of compounds in the RM, CM, AH and ZM extracts were computed from the calibration curves of the standard solutions of pure compounds. Figure 1: Chromatograms of HPLC analyses of standards of compounds. (A) Gallic acid, (B) Emodin, (C) Isovanillic acid. Figure 2: Chromatograms of HPLC analyses of plant extracts. (A) R. dentatus, (B) A. bracteosa, (C) Z. mauritiana, (D) C. benghalensis. All the five fractions (methanol, ethanol, benzene, chloroform and n-hexane) of the four plants (at highest concentration of 200 μg/mL and two-fold serially diluted to 0.09 μg/mL) were tested for anti- DENV-2 activity by plaque reduction neutralization test assay. Samples were evaluated for their prophylactic (pre-incubated with virus) and chemotherapeutic (6 h post-infection) effects, i.e. their ability to inhibit virus replication at challenge doses of 45 and 90 PFU. All the samples exhibited DENV-2 inhibition when added before virus infection at various concentrations without toxicity to BHK-21 cells. Among the fractions of R. dentatus, RM at 45 PFU virus dose exhibited the highest IC50 of 0.154 μg/mL, CC50 of 211.300 μg/mL, and selectivity index of 1 372.080 [Table 1]; while at 90 PFU virus dose, the values were IC50 of 0.234 μg/mL, CC50 of 211.300 μg/mL, and selectivity index of 902.990. The CM fraction of C. benghalensis was found to be the most potent, demonstrating IC50 of 0.270 μg/mL, CC50 of 298.100 μg/mL, and selectivity index of 1 104.070 at 45 PFU [Table 2]; while at 90 PFU, the values were IC50 of 0.516 μg/mL, CC50 of 298.100 μg/mL, and selectivity index of 577.490. For extracts of A. bracteosa, AH exhibited the highest inhibitory activity with IC50 of 0.340 μg/mL, CC50 of 290.000 μg/mL, and selectivity index of 852.940 at 45 PFU [Table 3]; but at 90 PFU, the values were IC50 of 0.831 μg/mL, CC50 of 290.000 μg/mL, and selectivity index of 348.980. 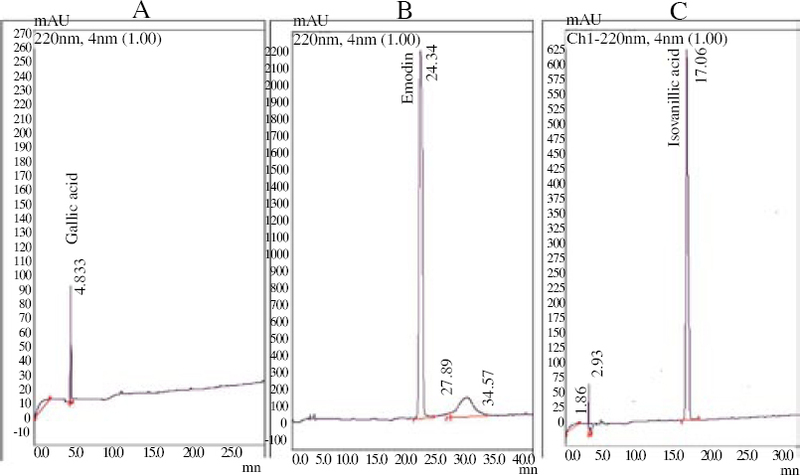 For extracts of Z. mauritiana, ZE at 45 PFU revealed the highest IC50 of 0.182 μg/mL, with CC50 of 324.100 μg/mL and selectivity index of 1 780.770 [Table 4]; while at 90 PFU, the values were IC50 of 0.640 μg/mL, CC50 of 324.100 μg mL, and selectivity index of 506.410. Table 1: IC50, CC50 and selectivity index of various fractions of R. dentatus at 45 and 90 PFU of DENV-2 infection. Table 2: IC50, CC50 and selectivity index of various extracts of C. benghalensis at 45 and 90 PFU of DENV-2 infection. Table 3: IC50, CC50 and selectivity index of various extracts of A. bracteosa at 45 and 90 PFU of DENV-2 infection. Table 4: IC50, CC50 and selectivity index of various extracts of Z. mauritiana at 45 and 90 PFU of DENV-2 infection. Individual pure compounds of gallic acid, emodin and isovanillic acid were also tested for inhibitory activity against DENV-2 using the same experimental strategies for plant extracts, starting with the highest concentration of 200 μg/mL down to 0.195 μg/mL Gallic acid revealed the highest inhibitory activity with IC50 of 0.19μg/ mL, CC50 of 89.765 μg/mL, and selectivity index of 469.408 at 45 PFU; while the values were IC50 of 0.522 μg/mL, CC50 of 89.765 μg/mL, and selectivity index of 171.963 at 90 PFU. Emodin also exhibited antiviral activity with IC50 values of 2.368 μg/mL and 5.515 μg/mL at 45 and 90 PFU, respectively. However, isovanillic acid did not display any significant DENV-2 inhibition [Table 5]. Table 5: IC50, CC50 and selectivity index of isovanillic acid, emodin and gallic acid at 45 and 90 PFU of DENV-2 infection. All the plant samples and pure compounds were also analyzed to determine any inhibition of DENV-2 replication by treatment post- infection. However, none of the plant fractions and compounds could inhibit the virus replication significantly when treatment was administered after 6 h post-infection. Given that many modern drugs are derived from natural precursors,, ethno-pharmacology and traditional medicine offer an attractive option for identifying starting material for drug discovery initiatives. This is the motivation of the current study which is to explore part of the indigenous herbal bio-resource in the Indian subcontinent, and to identify plants that may possess anti- DENV inhibitory activity. Plants provide a large range of natural compounds belonging to different molecular families that possess various medicinal properties. The isolation of various bioactive compounds from a range of plants has highlighted them as sources of novel antiviral agents,. Interestingly, the antiviral properties of plant-based extracts are often higher than their synthetic analogues in several studies. In this regard, the production of plant-based antiviral drugs offers a potentially promising alternative to combat viral diseases. In order to identify the step of the viral cycle where replication was prevented, DENV-2 was pretreated with the extracts or compounds prior to infection. In another strategy, the cells were first infected with virus, followed by addition of the extracts or compounds post-infection. A total of 20 extracts derived from four medicinal plants and three individual compounds were screened for prophylactic and chemotherapeutic effects against DENV-2. The range of concentrations of extracts did not cause significant toxicity to the BHK-21 cells. We observed increasing prophylactic effects of the plant extracts and compounds (except isovanillic acid) in a dosedependent manner. The most active plant extract was RM from R. dentatus, with a highly substantial IC50, while gallic acid was the most potent compound, when samples were allowed to interact with virus for one hour before the virus adsorption stage. It is thus likely that their antiviral activity is mediated by inactivation of the virus to prevent cellular entry. Previous ethnobotanical surveys also support our findings, as R. dentatus is widely used as medicinal plant-based remedies for different diseases ,,, e.g. antiviral activity of fruit extracts of Rumex cyprus. R. dentatus also possesses antibacterial, antifungal, insecticidal, molluscicidal, and allelopathic activities ,,. In addition, the CM extract of C. benghalensis possessed IC50 of 0.270 μg/mL and 0.516 μg/mL at 45 and 90 PFU, respectively. C. benghalensis is used in ethnomedicine given that it possesses antimicrobial, antioxidant, anxiolytic and sedative properties,. For extracts of A. bracteosa, the highest inhibition of DENV-2 was observed for the AH fraction with a very low IC50. Some members of the genus Ajuga have already been evaluated for antiviral potential. Antiviral activity of Ajuga decumbens against respiratory syncytial virus was reported, with an IC50 value of 131.600 μg/mL. Similarly, Luo et al documented in vitro inhibition of infectious bronchitis virus by water extracts of A. decumbens at concentrations between 750 and 1 500 mg/mL. Aqueous and methanol extracts of Ajuga integrifolia Ham. Buch are also effective against human immunodeficiency virus types 1 and 2. We also observed DENV-2 inhibitory effect of the ethanol extract of Z. mauritiana. Potent antioxidant activities of Z. mauritiana are reported for extracts from its seeds, fruits and leaves ,,. Furthermore, its bark and pulp exhibit strong cytotoxic potential against various cell lines. This species also demonstrates antimicrobial, anti- inflammatory, antidiabetic, antimicrobial and anxiolytic properties. Of all the samples tested, only isovanillic acid could not inhibit DENV-2 replication even at higher concentrations. Using the chemotherapeutic approach where samples were introduced following DENV-2 infection, none could inhibit virus replication, which alludes to these plant extracts and compounds acting as viral entry inhibitors. Our study has revealed that these plant extracts contain active components responsible for anti-DENV activity, and future studies are warranted to identify and isolate these active constituents which may also aid in determining their mechanisms of action. In conclusion, our study elucidated the in vitro DENV-2 inhibitory activities by extracts of R. dentatus, A. bracteosa, C. benghalensis, Z. mauritiana, as well as gallic acid and emodin. They were generally free from detrimental effects, and exerted their antiviral activities by prophylactic treatment, but not by treatment post-infection. More complete investigations are warranted on these plants for isolation, purification and characterization of bioactive principles responsible for anti-dengue activity, and to elucidate their underlying mechanisms of DENV inhibition. The authors acknowledge the technical assistance of S. H. Lau and Annie Hsu, and the support of the National University of Singapore and Quaid-i-Azam University. Tahir U, Khan UH, Zubair MS. Wolbachia pipientis: A potential candidate for combating and eradicating dengue epidemics in Pakistan. Asian Pac J Trop Med 2015; 8 (12): 989-998. Sarwar M. Mosquito-borne viral infections and diseases among persons and interfering with the vector activities. Int J Vaccines Vaccin 2016; 3 (2): 1-7. Pyke AT, Moore PR, Taylor CT, Hall-Mendelin S, Cameron JN, Hewitson GR, et al. Highly divergent dengue virus type 1 genotype sets a new distance record. Sci Rep 2016; 6: 22356. Bhatt S, Gething PW, Brady OJ, Messina JP, Farlow AW, Moyes CL, et al. The global distribution and burden of dengue. Nature 2013; 496 (7446): 504-507. Guo C, Zhou Z, Wen Z, Liu Y, Zeng C, Xiao D, et al. Global epidemiology of dengue outbreaks in 1990-2015: A systematic review and meta-analysis. Front Cell Infect Microbiol 2017; 7: 317. Lien PT, Duoc VT, Gavotte L, Cornillot E, Nga PT, Briant L, et al. Role of Aedes aegypti and Aedes albopictus during the 2011 dengue fever epidemics in Hanoi, Vietnam. Asian Pac J Trop Med 2015; 8 (7): 543-548. Endy TP, Anderson KB, Nisalak A, Yoon I, Green S, Rothman A, et al. Determinants of inapparent and symptomatic dengue infection in a prospective study of primary school children in KamphaengPhet, Thailand. PLoS Negl Trop Dis 2011; 5 (3): 975. Khetarpal N, Khanna I. Dengue fever: causes, complications, and vaccine strategies. J Immunol Res 2016; 20 (1): 1-14. Halstead SB, Mahalingam S, Marovich MA, Ubol S, Mosser DM. Intrinsic antibody-dependent enhancement of microbial infection in macrophages: disease regulation by immune complexes. Lancet Infect Dis 2010; 10 (10): 712-722. Yam-Puc JC, Cedillo-Barrón L, Aguilar-Medina EM, Ramos-Payán R, Escobar-Gutiérrez A, Flores-Romo L. The cellular bases of antibody responses during dengue virus infection. Front Immunol 2016; 7 (1): 218. Raheel U, Faheem M, Riaz MN, Kanwal N, Javed F, Qadri I. Dengue fever in the Indian subcontinent: an overview. J Infect Dev Countries 2010; 5 (4): 239-247. Yung CF, Lee KS, Thein TL, Tan LK, Gan VC, Wong JG, et al. Dengue serotype-specific differences in clinical manifestation, laboratory parameters and risk of severe disease in adults, Singapore. Am J Trop Med Hyg 2015; 92 (5): 999-1005. Ali A, Ahmad H, Idrees M, Zahir F, Ali I. Circulating serotypes of dengue virus and their incursion into non-endemic areas of Pakistan; a serious threat. Virol J 2016; 13 (1): 144. Hayes C, Baqar S, Ahmed T, Chowdhry M, Reisen W. West Nile virus in Pakistan. 1. Sero-epidemiological studies in Punjab Province. Trans R Soc Trop Med Hyg 1982; 76 (4): 431-436. Noyd DH, Sharp TM. Recent advances in dengue: relevance to Puerto Rico. P R Health Sci J 2015; 34 (2): 65-70. Xie ML, Phoon MC, Dong SX, Tan BKH, Chow VT. Houttuynia cordata extracts and constituents inhibit the infectivity of dengue virus type 2 in vitro. Int J Integr Biol 2013; 14 (S1): 78-85. Chiow KH, Phoon MC, Putti T, Tan BKH, Chow VT. Evaluation of antiviral activities of Houttuynia cordata Thunb. extract, quercetin, quercetrin and cinanserin on murine coronavirus and dengue virus infection. Asian Pac J Trop Med 2016; 9 (1): 1-7. Shinwari ZK. Medicinal plants research in Pakistan. J Med Plants Res 2010; 4 (3): 161-176. Umair M, Altaf M, Abbasi AM. An ethnobotanical survey of indigenous medicinal plants in Hafizabad district, Punjab-Pakistan. PloS One 2017; 12 (6): e0177912. Litvinenko YA, Muzychkina RA. Phytochemical investigation of biologically active substances in certain Kazakhstan Rumex species. Chem Nat Comp 2003; 39 (5): 446-449. Mothana RAA, Abdo SAA, Hasson S, Althawab FMN, Alaghbari SAZ, Lindequist U. Antimicrobial, antioxidant and cytotoxic activities and phytochemical screening of some Yemeni medicinal plants. Evid Based Complement Alternat Med 2010; 7 (3): 323-330. Marwat SK, Khan MA, Rehman FU, Ahmad M, Zafar M, Sultana S. Salvadora persica, Tamarix aphylla and Zizyphus mauritiana - three woody plant species mentioned in Holy Quran and Ahadith and their ethnobotanical uses in north western part (D.I. Khan) of Pakistan. Pak J Nutrition 2009; 8 (5): 542-547. Paresh J, Chanda SV. Antibacterial activity of aqueous and alcoholic extracts of 34 Indian medicinal plants against some Staphylococcus species. Turk J Biol 2008; 32 (1): 63-71. Sambrekar SN, Patil PA, Kangralkar VA. Protective activity of Commelina benghalensis root extracts against paracetamol induced hepatic damage in Wistar rats. Pharmacol Online 2009; 3: 836-844. Hasan SMR, Hossain MM, Faruque A, Mazumder MEH, Rana MS, Akter R, et al. Comparison of antioxidant potential of different fractions of Commelina benghalensis Linn. Bangladesh J Life Sci 2008; 20 (2): 9-16. Mbazima VG, Mokgotho MP, February F, Rees DJG, Mampuru LJ. Alteration of Bax-to-Bcl-2 ratio modulates the anticancer activity of methanolic extract of Commelina benghalensis (Commelinaceae) in Jurkat T cells. Afr J Biotechnol 2008; 7 (20): 3569-3576. Chowdhury TA, Hasanat A, Jakaria M, Mostafa ATMK, Kabir MSH, Hossain S, et al. Thrombolytic and cytotoxic activity of methanolic extract of Commelina benghalensis (Family: Commelinaceae) leaves. J Sci Innov Res 2015; 4 (2): 100-104. Ibrar M, Rauf A, Hadda TB, Mubarak MS, Patel S. Quantitative ethnobotanical survey of medicinal flora thriving in Malakand Pass Hills, Khyber Pakhtunkhwa, Pakistan. J Ethnopharmacol 2015; 169 (1): 335346. Kayani WK, Dilshad E, Ahmed T, Ismail H, Mirza B. Evaluation of Ajuga bracteosa for antioxidant, anti-inflammatory, analgesic, antidepressant and anticoagulant activities. BMC Complemen Altern Med 2016; 16 (1): 375. Hsieh WT, Liu YT, Lin WC. Anti-inflammatory properties of Ajuga bracteosa in vivo and in vitro study and their effects on mouse model of liver fibrosis. J Ethnopharmacol 2011; 135 (1): 116-125. Chow VT, Lim CS, Phoon MC, Tan HC. A seroprevalence survey of dengue virus infection in healthy Singapore university undergraduates by enzyme immunoassay and plaque reduction neutralization test. Dengue Bulletin 2005; 29 (1): 97-105. Lim CS, Chua JJ, Wilkerson J, Chow VT. Differential dengue cross- reactive and neutralizing antibody responses in BALB/c and Swiss albino mice induced by immunization with flaviviral vaccines and by infection with homotypic dengue-2 virus strains. Viral Immunol 2006; 19 (1): 3341. Gupta R, Gabrielsen B, Ferguson SM. Nature’s medicines: Traditional knowledge and intellectual property management. Case studies from the NIH, USA. Curr Drug Discov Technol 2005; 2 (4): 203-219. Atanasov AG, Waltenberger B, Pferschy-Wenzig EM, Linder T, Wawrosch C, Uhrin P, et al. Discovery and resupply of pharmacologically active plant-derived natural products: A review. Biotechnol Adv 2015; 33 (8): 1582-1614. Newman DJ, Cragg GM. Natural products as sources of new drugs from 1981 to 2014. J Nat Prod 2016; 79 (3): 629-661. Li Q, Maddox C, Rasmussen L, Hobrath JV, Whit LE. Assay development and high-throughput antiviral drug screening against bluetongue virus. Antiviral Res 2009; 83 (3): 267-273. Severson WE, Dowell MM, Ananthan S, Chung DH, Rasmussen L, Sosa MI, et al. High-throughput screening of a 100 000-compound library for inhibitors of influenza A virus (H3N2). J Biomol Screen 2008; 13 (9): 879887. Tang LI, Ling AP, Koh RY, Chye SM, Voon KG. Screening of antidengue activity in methanolic extracts of medicinal plants. BMC Complement Alternative Med 2012; 12 (1): 3. Rahman IU, Ijaz F, Iqbal Z, Afzal A, Ali N, Afzal M, et al. A novel survey of the ethno medicinal knowledge of dental problems in Manoor Valley (Northern Himalaya), Pakistan. J Ethnopharmacol 2016; 194 (1): 877-894. Sher H, Hussain F. Ethnobotanical evaluation of some plant resources in Northern part of Pakistan. Afr J Biotechnol 2009; 8 (17): 4066-4076. Ali H, Sannai J, Sher H, Rashid A. Ethnobotanical profile of some plant resources in Malam Jabba valley of Swat, Pakistan. J Med Plant Res 2011; 5 (17): 4171-4180. Hussain F, Mobeen F, Ki B, Yoo SO. Allelopathic suppression of wheat and mustard by Rumex dentatus ssp. klotzschianus. J Plant Biol 1997; 40(2): 120-124. Liu SY, Sporer F, Wink M, Jourdane J, Henning R, Li YL, et al. Anthraquinones in Rheum palmatum and Rumex dentatus (Polygonaceae), and phorbol esters in Jatropha curcas (Euphorbiaceae) with molluscicidal activity against the schistosome vector snails Oncomelania, Biomphalaria and Bulinus. Trop Med Int Health 1997; 2 (2): 179-188. Umer A, Yousaf Z, Khan F, Hussain U, Anjum A, Nayyab Q, et al. Evaluation of allelopathic potential of some selected medicinal species. Afr J Biotechnol 2010; 9 (37): 6194-6206. Sharma MC, Sharma S. Preliminary phytochemical and antimicrobial investigations of the aqueous extract of Ixora coccinea Linn and Commelina benghalensis L. on gram positive and gram negative microorganisms. Middle East J Sci Res 2010; 6: 436-439. Hasan SMR, Hossain MM, Akter R, Jamila M, Mazumder MEH, Alam MA, et al. Analgesic activity of the different fractions of the aerial parts of Commelina benghalensis Linn. Int J Pharmacol 2010; 6 (5): 63-67. Ma SC, Du J, But PPH, Deng XL, Zhang YW, Ooi VEC, et al. Antiviral Chinese medicinal herbs against respiratory syncytial virus. J Ethnopharmacol 2002; 79 (2): 205-211. Luo MC, Zheng XF, Fan XP. In vitro inhibition of infectious bronchitis virus by ciliate bugle herb (Jin Gu Cao). J Longyan Univ 2009; 27 (1): 7779. Asres K, Bucar F, Kartnig T, Witvrouw M, Pannecouque C, DeClercq E. Antiviral activity against human immunodeficiency virus type 1 (HIV-1) and type 2 (HIV-2) of ethnobotanically selected Ethiopian medicinal plants. Phytother Res 2001; 15 (1): 62-69. Dahiru D, Obidoa O. Pretreatment of albino rats with aqueous leaf extract of Zizyphus mauritiana protects against alcohol induced liver damage. Trop J Pharm Res 2007; 6 (2): 705-710. Dahiru D, William ET, Nadro MS. Protective effect of Ziziphus mauritiana leaf extract on carbon tetrachloride-induced liver injury. Afr J Biotechnol 2005; 4 (10): 1177-1179. Bhatia A, Mishra T. Free radical scavenging and antioxidant potential of Ziziphus mauritiana (Lamk.) seed extract. J Compl Integr Med 2009; 8 (1): 42-46. Vahedi F, Najafi MF, Bozari K. Evaluation of inhibitory effect and apoptosis induction of Zyzyphus Jujube on tumor cell lines, an in vitro preliminary study. Cytotechnology 2008; 56 (2): 105-111. Al-Reza SM, Yoon JI, Kim HJ, Kim J, Kang SC. Anti-inflammatory activity of seed essential oil from Zizyphus jujuba. Food Chem Toxicol 2000; 48 (2): 639-643. Cisse A. Antidiabetic activity of Zizyphus mauritiana Lam Rhamnaceae. Dakar Med 2000; 45 (2): 105-107. Kayser O, Arndt SK. Antimicrobial activity of some Zizyphus species used in traditional medicine. Pharmaceut Pharmacol Lett 2000; 10 (1): 3840. Peng WH, Hsieh M, Lee YS, Lin YC, Liao J. Anxiolytic effect of seed of Ziziphus jujuba in mouse models of anxiety. J Ethnopharmacol 2000; 72 (3): 435-441.